One year after its signing, most Americans want Obamacare repealed. President George W. Bush famously claimed to be “the decider” when it came to military matters. Last year, President Obama made his case to the American people that the federal government should be the decider when it comes their health care. Unfortunately for President Obama, a majority of the people don’t buy his argument. In a recent Rasmussen poll, Americans favor repeal of the health care reform law by a margin of 53 to 40 percent. In the November 2010 elections, Republicans won a majority of seats in the house, but Democrats still hold a majority in the senate. Republicans can pass a repeal law in the house (and did so as one of their first acts), but the bill cannot pass the senate. The result is a stalemate as the lawsuits challenging the law wind their way through the federal court system. Enter the Health Care Compact as an alternative to repealing Obamacare or waiting for the Supreme Court to rule the law unconstitutional. The Health Care Compact is an interstate agreement that would supersede the federal regulations in the Patient Protection and Affordable Care Act and replace them with state law. State health laws and coverage would be funded with federal money that is appropriated to the states under mandatory federal spending. There are several important aspects in the compact’s five pages. The states that join the compact take a pledge to “improve Health Care policy” and gives state legislatures the “primary responsibility to regulate Health Care in their respective states.” This means that the state has the power to “suspend by legislation” federal laws regarding health care. It also establishes a right to the state’s Current Year Funding Level which would be “funded by Congress as mandatory spending and not subject to annual appropriation.” States could amend the compact with the approval of other members. They can also withdraw from the compact at any time. The compact would also establish an Interstate Advisory Health Commission made up of member states. The purpose of the commission would be to study health care regulation and make nonbinding recommendations, which could then be voted on by the states. The commission would be an advisory body only and would not have legislative power or be a centralized authority to replace the federal government. The compact would become effective when ratified by at least two states and after congress gives its consent (as required by Article 1, Section 10 of the Constitution). Congressional consent might be hard to achieve in the senate, but would probably be easier than passing a repeal of Obamacare under the current makeup of Congress. Like a typical law, the legislation affirming the compact would also be subject to a presidential veto. The Health Care Compact might be easier to enact than a repeal of Obamacare because the health care reform law is President Obama’s signature piece of legislation. It is extremely unlikely that he would not veto a bill that repealed it. He might be more willing to allow a compact that would allow states to opt out while preserving his landmark law. The ever-increasing list of companies granted waivers from the health care law is evidence that the Administration realizes that there are significant problems to the Democratic health care solution. 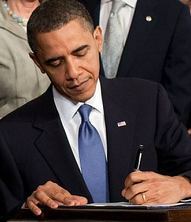 President Obama is on record as supporting amendments to ease the mandates in his health care law. Likewise, Democratic senators might be more inclined to vote for the compact than a repeal bill. In 2012, twenty-one Democratic senators will be up for reelection. Bernie Sanders of Vermont and Joe Lieberman of Connecticut are independents who caucus with the Democrats and will also face reelection. The heavy Democratic losses of 2010 will be fresh in the minds of these senators and, if voter anger persists, many will be very vulnerable to Republican challengers. Many of these Democratic senators might be persuaded to vote to give consent to the compact as a way to atone for their vote to enact Obamacare. In the current congress, the Republicans have 47 senators. That means that they would only need 4 Democratic votes to consent to the Health Care Compact (assuming that all Republicans voted for it). If President Obama vetoed the compact, the Republicans would need 19 Democratic senators to override the veto. One of the biggest weaknesses of President Obama’s health care reform is that it tries to be all things to all people. It is a one-size-fits-all solution to a problem that is different for each state. The Health Care Compact would resolve that problem by taking the power to regulate health care away from the federal government and returning it to the states. Each state could devise its own solution for the health care crisis as the framers of the Constitution intended. Theoretically, the solutions could range from pure free market capitalism the red states to a single-payer system in the blue states. If a state elected not to join the compact, they could still accept the federal solution. Moving control over health care to the states would move authority closer to the people. Rather than dealing with a Washington, D.C. bureaucrat, people would deal with agencies in their own state or town. This would make government more responsive to the people’s needs. UCLA law professor Adam Winkler has noted that congressional approval of interstate compacts is required only when the subject is “appropriate for congressional legislation.” In his view, this means the Health Care Compact is a tacit admission that congress has the power to regulate health insurance. In this scenario, the Health Care Compact might be revised to be deemed in effect when two or more states ratify it or else it could be held in reserve as a strategy to be used if the health care law is ultimately ruled to be constitutional. In any case, the drive toward the Health Care Compact is well underway. Since its introduction in February 2011, the compact has been introduced in eight states. This month Georgia became the first state enact the compact when Governor Nathan Deal signed it into law on April 20, 2011.